Root canal therapy is used to save your tooth and relieve pain. The only alternative to root canal therapy is to remove the tooth. At Westlake Hills Dentistry we understand the anxiety and fear associated with some dental procedures, but today’s root canal therapy is no more involved than having a traditional filling. Dr. Ho may recommend a root canal if you have a damaged or infected tooth in order to save the tooth and restore your smile. Dr. Ho will take care of your Root Canal Therapy. Inside of your tooth is the living tissue which includes soft tissue, nerves, and blood vessels. Sometimes this inside pulp becomes infected or damaged and can cause pain and discomfort. Instead of pulling the affected tooth, root canal therapy can save your tooth and retain your tooth and your natural bite and alignment of your teeth. 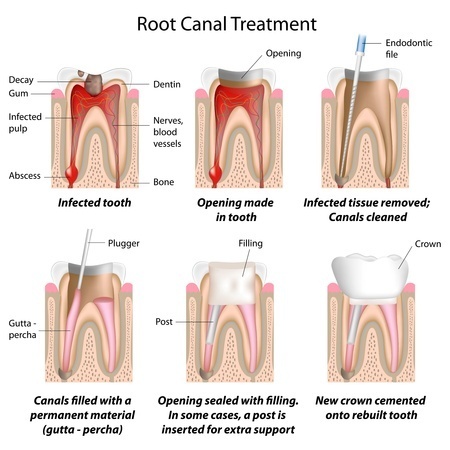 Root canal therapy not only repairs but protects your tooth from further damage or infection. First Dr. Ho will discuss the procedure with you and answer any questions you may have. You will be made comfortable and a local anesthetic will be administered. An examination of the tooth or teeth and surrounding tissues as well as X-rays and digital images may also be taken at this time. Dr. Ho then removes the inner tissue, cleans and sterilizes the area and fills it with a material known as gutta-percha. Gutta-percha is rubber like material and it seals and protects the tooth from further infection. A temporary crown is placed on the tooth to further protect it while it heals. Once it heals (about two weeks) you will return and Dr. Ho will place a permanent crown on the tooth. Your new permanent crown is made right in our office using CEREC® technology and the doctor will match the color and shape of your natural tooth so that your tooth is restored and healthy. Your tooth will be strong, protected, and you will be pain free. A root canal not only retains the tooth but also your natural bite and alignment and is an excellent way to save your tooth. The procedure is no more involved than getting a cavity filled and can be done under local anesthesia so you can go about your day after your appointment. For more information about root canal treatments in Austin, Texas, contact Westlake Hills Dentistry today. Our offices are equipped to provide an array of restorative procedures such as porcelain veneers, dental implants, composite bonding, and tooth-colored fillings.